Today, I took the ferry between Wall Street and Staten Island. 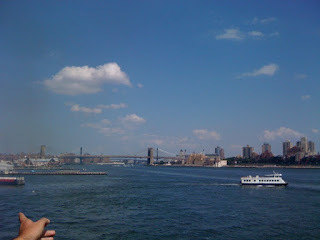 The view was simply amazing, blue waters and city landscape, under the bright sparsely decorated sky. I would say this is one of the must-do's for anyone visiting New York City. Even more surprised to me was that the ferry is completely free, running every 30 minutes with heavy traffic, 7 days a week. Similar ferry in San Francisco, between the Pier 39 and Sausalito would have costed $22 round trip. Salute to the transportation department of NYC! This got me thinking, why should we pay anything at all for local public transportation? Local city buses, subways, ferries, should and can be made completely free! This would encourage every commuter to seriously consider abandoning driving, thus reducing our carbon emission, eliminating highway congestion, resulting cleaner air and better lives for all. The online world has gotten used to free services with ads support. Why the same model can't be applied to public transportation? Make some creative use of the empty inner walls on the bus, in the subway, and in the stations. Free services will guarantee a huge spike in the amount of people taking these buses and subways, and thus the amount of eyeballs, which increases the value of these ad spaces also. 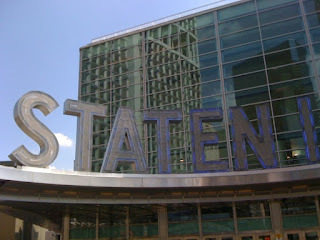 Let's learn something from the Staten Island ferry, and make public transportation free!